Wilma Gertrude FOLAND, daughter of John and Lefa (BRAMMER) RAMSEY, was born Sept. 17, 1908, near Grand River and died Jan. 5, 1995, at Clarke County Hospital in Osceola, She was 86. She received her education in Grand River Schools and graduated from Grand River High School. Following high school, she taught for three years at Jefferson (Funktown) and one year at Westerville, rural schools near Grand River. While in high school, she became a member of the Pleasant Valley Baptist Church northeast of Grand River. Her membership was later transferred to the Grand River Baptist Church, to the Van Wert Christian Church, and in 1987 to the First Christian Church in Osceola. She married Nolan Paul FOLAND on Jan. 31, 1931, in Des Moines. They were the parents of two sons, Don Richard and Darel Duane. They lived in southeastern Colorado near Bartlett as wheat farmers during the Dust Bowl days. In 1937, after 15 months in the mountains near Paonia, Colo., they returned to Iowa and farmed near Grand River for two years. They moved to a farm west of Van Wert and in 1980, they retired from the farm and moved to Osceola. 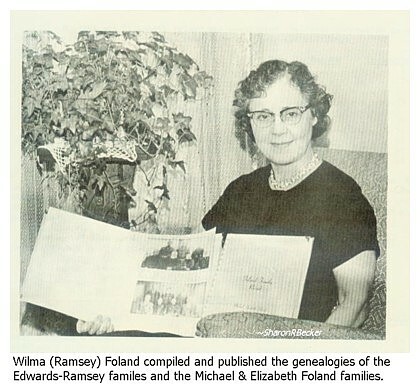 Mrs. FOLAND was well-known for compiling and editing her record books for the RAMSEY and EDWARDS families and one for the FOLAND family. They are displayed in different libraries and the Historical Building in Des Moines. She was preceded in death by her parents; husband, Nolan in 1987; sister, Rosamond RAMSEY in 1990; brothers-in-law, Sanford SHIELDS and Rae SHANKS; and sisters-in-law Esther PALMER and Thelma SIMBRO. Mrs. FOLAND is survived by sons, Don FOLAND and wife Verda of Indianola; Darel FOLAND and wife Phyllis of Van Wert; six grandchildren; nine great-grandchildren; a great-great-granddaughter; sisters, Phyllis BOWE and husband Neale of Des Moines, Hazel SHIELDS of Jacksonville, Fla., Lois SHANKS of Sebring, Fla.; brother-in-law, Albert FOLAND of Grand River; and other relatives and friends. Funeral services for Mrs. FOLAND were Jan. 7, 1995, at Kale Funeral Homes in Osceola with the Rev. Neville CLAYTON of Osceola officiating. Organist Pennie GONSETH accompanied soloist Pastor Chuck DeVOS in the musical selections Whispering Hope and Precious Memories. Casket bearers were Dan FOLAND, Gary BEACH, Michael FOLAND, Richard FOLAND, Bradley MILLER and Dustin MILLER. Honorary casket bearers were Justin DRAKE and Matthew DRAKE. Interment was in Grand River Cemetery in Grand River.